For lack of a better name... I have begun Ripping my 480 Twin tone apart for its enormous upgrade and overhaul. Upgrades as follows (for those interested) Pictures and YouTube video to be uploaded soon. -B18FT Turbo engine. Undergoing a full rebuild (all new seals/ gaskets, piston rings, replacement head from a Renault 5GT tuner, had all stem seals and new valves done. -JC5 gearbox from clio 172 as stock m54 won't last all that long. I can't find an M59 unit that's not stupid money. -Uprated F7R oil pump as im ditching the stock sandwich cooler (you'll see why in a minute) need the extra oil pressure. -Standard turbo was uninteresting and isn't far off needing a rebuild... so I opted for a rebuilt Holset HX25 (wastegateless design) with T2 flange so bolts onto stock manifold. Fast spool and newer technology, td04 variant used on the scoobys/ evo's quite a bit larger but wont cause all that much more lag. -Tial 40mm Wastegate as turbo doesn't have an internal one. 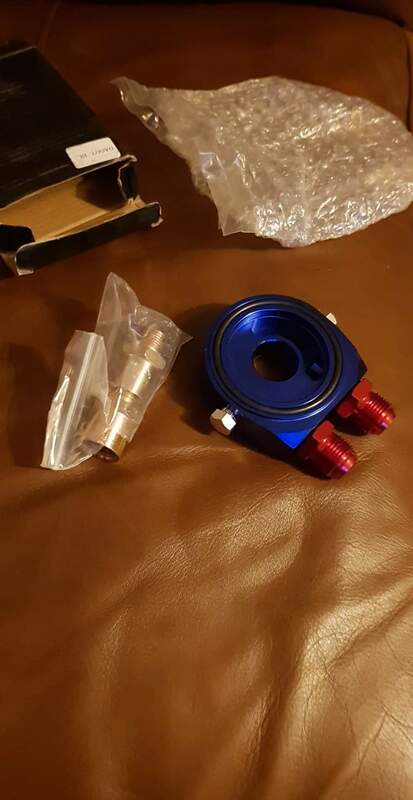 -Mocal 12 row oil cooler + oil filter adapter as holset turbo is not watercooled like the stock garrett, only oil so figured better cooling will be required. -Stage 2 or 3 black diamond clutch. -Omex 600 ECU and loom. Ditching the stock ECU's and other unreliable components (MAF, idle Control valve etc) can control the torque by gear to limit wheelspin when accelerating. -480 turbo brake calliper upgrade + drilled/ slotted disks. -AIR conditioning retrofit from Cranna's 480 GT (i can't stand the heat in these cars when its summer) Wish me luck. The plan is to run respectable power, be a comfortable yet good handling car with decent shove (Around 200 BHP mark) as i don't want to be ripping the engine apart again for a long time afterwards. Will try to document and video what I can as there's not much up to date info with upgrades going to this length. Pictures no longer work etc. This will be really interesting to follow. Specifically the engine tuning and suspension since I have one 480 Turbo that I want to tune also. By the way what GAZ coilovers are you going to use? I have tried to find some coilover kit from a known manufacturer but have not found anything. You won't be able to find them on GAZ's site as Dai gets them special order through Classic Swede. If you don't mind waiting a while for them. Yeah the two tone is different. It's taken me a while to come round to the green colour, but looking at that car in the sea of German grey and white you see nowadays. The little green car just stands out and you get so much attention at car meets its unreal. The odd look from the younguns and the older lot have that "omg i remember those" expression! Just need to sort the paintwork out next. But thats last to do, no point sorting that till the modifications are complete. Coilers and polybushes were dispatched yesterday from the order i put on in Novemeber, GAZ can be slow! but worth the wait i assure you. Last edited by justtank on Tue Feb 05, 2019 9:00 am, edited 1 time in total. Cheers, wasnt all that sure which selection would input the images. Aha but then it's the coilover kit I emailed DAI about. It's the only coilover kit I have found in my many hours of search so far for the volvo 400. I have been thinking about getting them but haven't seen any feedback from anyone using them. Also in Sweden GAZ is not so well known so I was not sure how the quality was compared to brands like Bilstein and KW coilovers. But you seem positive about GAZ so this makes me lean more to ordering a kit for the summer and stop the search . I've been for a ride in Fraser Crannas F7R swapped 480 using the same coilovers and i can confirm that they are a quality set. Handles like its on rails man. Just had delivery of them (will upload pics soon) beautiful. Quality materials and adjustable dampening and camber plates if your into that kind of thing. But its nice to have if your want to track the car. 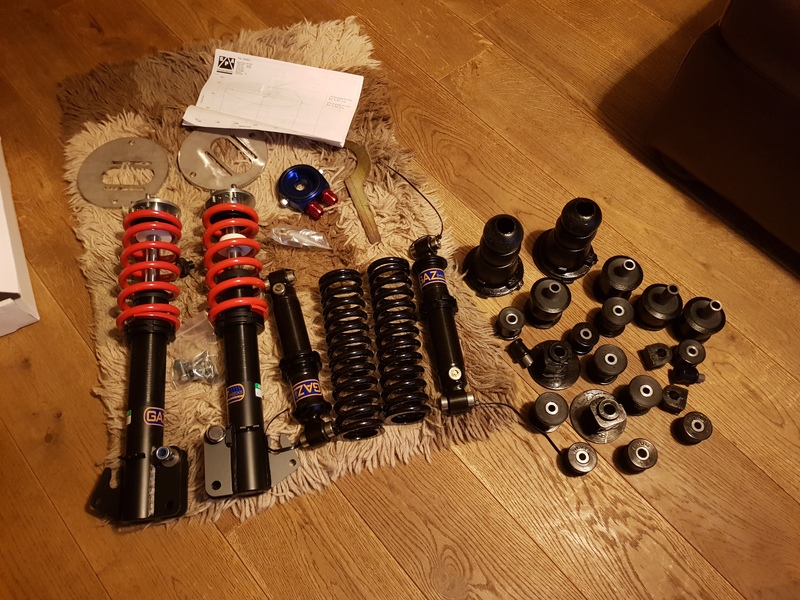 Im still trying to figure out this image linking system, apologies but here's the coilovers, polybushes and external oil filter/cooler adapter. Last edited by justtank on Wed Feb 06, 2019 12:54 pm, edited 1 time in total. so you press the wee picture then paste the link in the gap? Nice one mate, looks to have worked. Noob to this forum my bad! Sounds like a proper upgrade to me I am very curious about the total part cost incurred (not counting labour) and the final result on a rolling road or track! Spring length; There seems to be quite a lot of thread available on the strut, so why not a longer spring? I'd have thought that shorter springs could coil bind easier on compression (severe bumps) and loose contact with either end when the suspension goes into droop (coming off a bump) causing severe slamming when the suspension comes back down and the spring makes contact again with the spring perches. Now, it could be that length because you can't physically use the rest, or that longer springs in the poundage that their at are not available - I'm just curious! I had no choice in the springs, you get what you buy. 480s aren't very heavy remeber. But it's not be all end all, can just change the spring. I was looking into putting a smaller softercoil to sit ontop like my s60 has with its KW vairent coilovers. I bought them after experiencing them in another car and had no issues doing many speeds on Scotland's windy roads. Never had i thought a 480 could handle the way it did. Hats off to cranna for an excellent job. Will need strut brace as the body flexes and adjustable panhard bar to go on the rear. 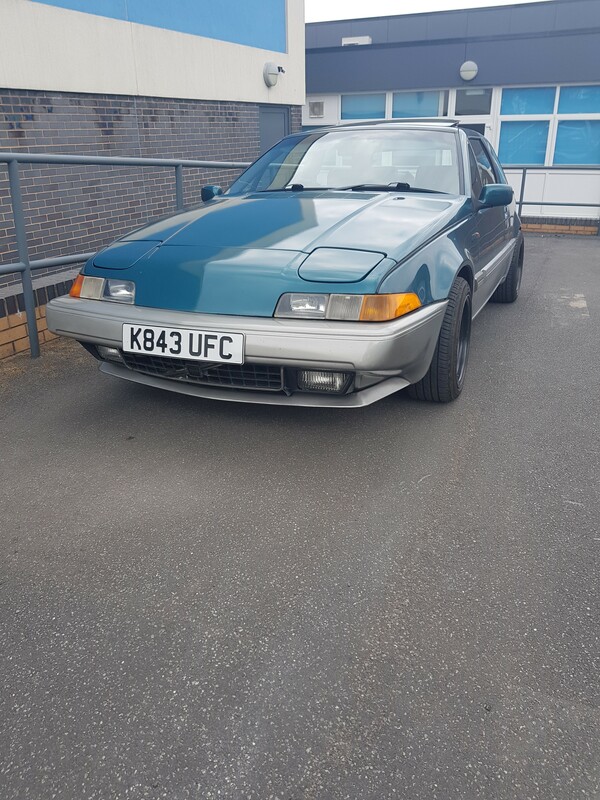 So far with 2 cars consolidating into 1 (first car was rotten) I have spent around 7k £ on this particular 480 so far, but I'm having to aquire tools to do jobs I'd rather learn to do myself, this I'm adding into the equation. Saved myself a whole lot of money especially the interior most places charge about 3/4 k but I got away with 250 for just materials. Took months to do though! I think that Fraser (Cranna) just removed the return lip so he could fit wider wheels/ lower etc, but maybe your wheels are just too wide? but going for front coil-overs sorts the lack of front lower spring pans, see Arthuy's thread, (viewtopic.php?f=19&t=34997&start=260#p216533) he is looking for a pair!! Fraser has rolled the lip back, I have done the same, one side worked okay until you had more than 2 people in the car. However there was a bit of rust on the driver side which caused it to not roll correctly. Im having them cut out and rewelded again properly so that they will accommodate the wheels, I want the extra grip with the wider tyres, should mean less wheelspin, which is why I went bigger.